A plaque dedicated along with black gum tree planting to honor a century of service in the community from the local branch of the Rotary Club. A gum tree was planted outside Academic Hall on April 5 to honor the 100th anniversary of the Rotary Club and the service towards the community. 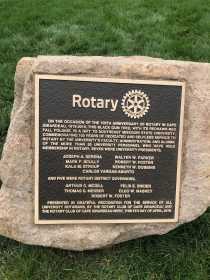 The tree is dedicated to the century of commitment and service to the Rotary Club organization by the university’s faculty, administration and alumni. The tree is located outside Academic Hall along with a plaque, both dedicated by the Rotary Club of Cape Girardeau and the Rotary Club of Cape Girardeau-West. A Black Gum tree was planted and dedicated to the local rotary club for a century of service in the community. Several Rotary Club members and Southeast president Carlos Vargas spoke at the tree planting and dedication Friday morning. Vargas along with six other Southeast presidents are members of the organization. 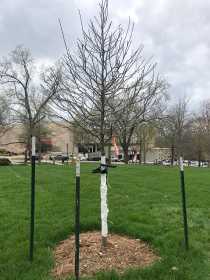 “Southeast is extremely appreciative of the Cape Girardeau Rotary Club and the Cape West Rotary Club for their gift of a black gum tree and plaque on our campus, commemorating the wonderful 100-year partnership the university and Rotary have shared,” Vargas said in a statement about the tree planting. The Rotary Club of Cape Girardeau was founded in 1919 to provide the community opportunities with local professionals while working with Rotary International humanitarian service efforts. Vargas also said the university looks forward to launching a student organization, Rotaract Club, a partner of the Rotary Club in the near future. It will offer opportunities for students to exchange ideas with community leaders and develop their leadership skills through service. To celebrate its 100th anniversary the Rotary Club has planted 100 trees in the past year to honor the positive impact this organization has had among communities. This tree is the 101st Friendship Tree to be planted by the Rotary Club across the country.